A renowned designer created a unique stone bridge dining room in a 17th C service passageway. 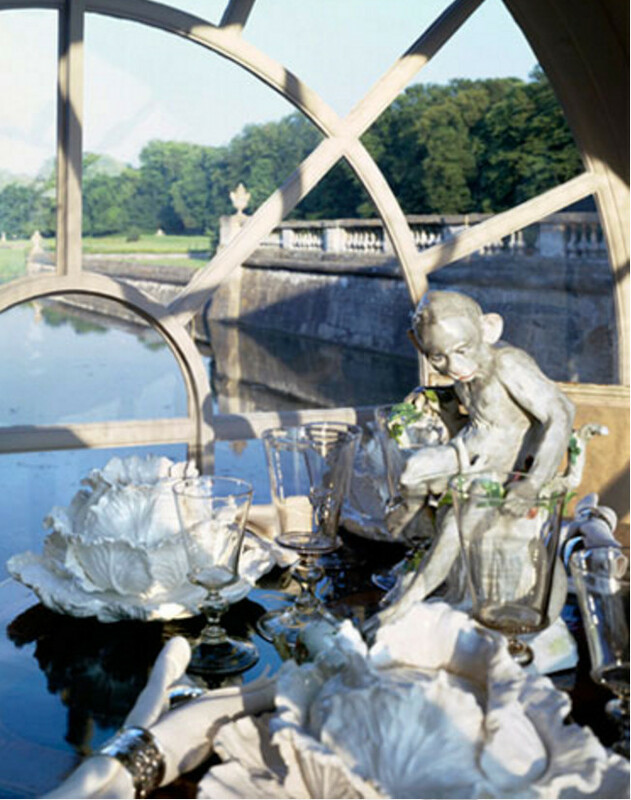 An unforgettably unique and beautiful dining room occupies the lower level of a weathered stone bridge that spans the moat of the 17th century Château du Maris, 30 miles south of Paris. 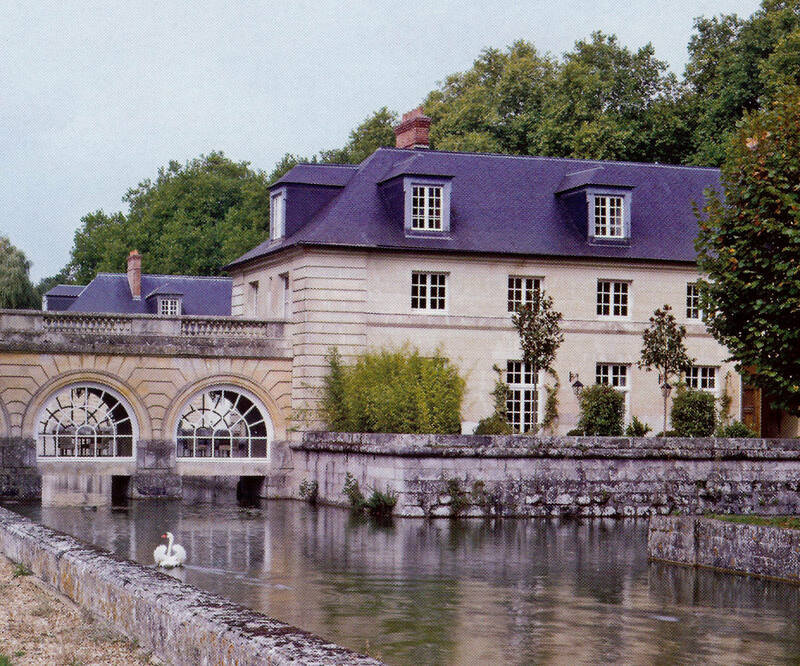 Formerly a service passage connecting two wings of the chateau, the the bridge is graced by an arcade of three semi-circular windows on each side. The pairs of windows provide a see-through effect providing views of the 100 acre property in two directions. 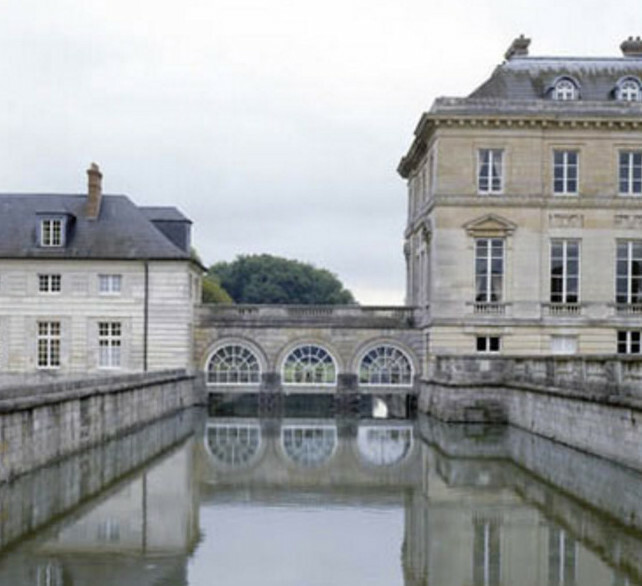 The passageway was converted into a dining room by international designer Juan Pablo Molyneux who renovated a wing of the château for his own use about a decade ago. 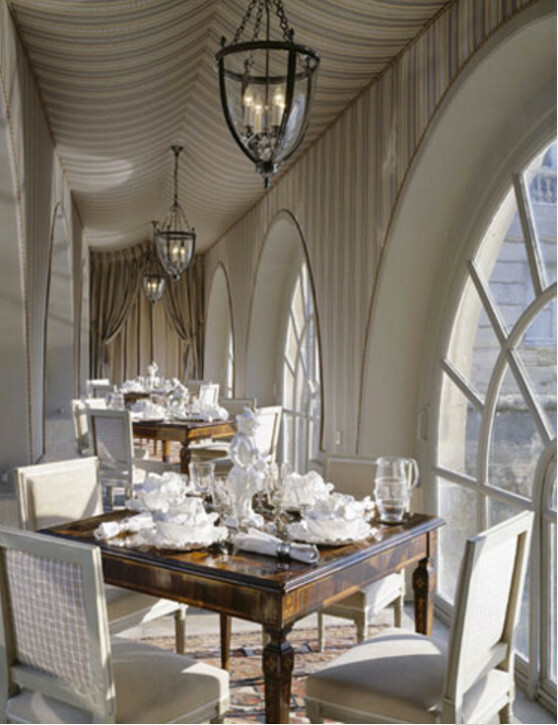 To take advantage of the views, Italian marquetry tables for four, with pedigreed Louis XVI chairs by the great Georges Jacob, are placed in front of windows that overlook gardens and parklands. To dress up the rather narrow passageway, and hide heating ducts that run along the ceiling, the designer covered both the ceilings and walls with traditional tone-on-tone Scalamandré striped fabric edged in gimp. One end of the passage is elaborately draped — layered decorating with an 18th century aesthetic is a hallmark of Mr. Molyneux’s highly embellished style. Iron lantern pendants are suspended above each table. While the Molyneux taste runs to white majolica and singerie (yes, that’s a money sculpture centerpiece) what appeals to me most are the huge windows that flood the narrow space with light. What an enchanting place to eat lunch whether the sun is shining or snow is falling! The possibility of converting a service passage with great windows over a moat into a singular dining room is certainly rare. And while the quality of the furnishings in the space contribute to the historical ambience, the table and chairs had been purchased from IKEA I wouldn’t mind. The underlying idea is to use the space and seize the views!